Mohit Suri has become one of the hottest directors in Bollywood in the past few years after delivering big hits like Murder 2, Aashiqui 2 and Ek Villain. Funnily enough, Hamari Adhuri Kahani is the first time in 5 years a Mohit Suri film doesn’t have a number in its title. Anyhow, he has now teamed up with two actors who have been going through the worst phases of their respective careers; Vidya Balan and Emraan Hashmi just can’t get it right these days. That is why, inspite of having a chartbuster title track, Hamari Adhuri Kahani hasn’t created the required buzz to get a good opening. Is the film any good and will it continue Mohit Suri’s good streak? Story: Hamari Adhuri Kahani begins with a flashback that ruins a major twist in the film. Vasudha (Vidya Balan) and Hari (Rajkumar Rao) are involved in an abusive marriage where Hari is a typical male chauvinist. He gets his name tattooed on Vasudha’s body to assert his dominance. Fortunately (rather than unfortunately) Hari gets booted away to jail on the suspicion of being a terrorist and Vasudha has to bring their child up all by herself working as a florist. By a chance encounter after half a decade, Vasudha meets a mega-rich hotelier Aarav Ruparel (Emraan) and through a song and some heavy duty dialogues they fall in love. But the problem arises when Hari makes a comeback and the fairytale love story of Vasudha and Aarav gets destroyed. Screenplay and Direction: ‘Hamari Adhuri Kahani’ should have been better called ‘Hamari Sobby Kahani’. It is a sob story where the lead actress cries her way through the film. The intentions of the makers can’t be doubted as the basic storyline shows promise but the dialogues by Shagufta Rafique and the ultra melodramatic treatment makes ‘Hamari Adhuri Kahani’ almost a torture to sit through. The spiced up drama and the emotional quotient of the film, glamorised on Indian television for decades, could be liked by a lot of people, no doubt, but the ones who aren’t fans of such extra emotions should avoid the film. Additionally, ‘Hamari Adhuri Kahani’ gets bogged down by the slow pace of proceedings. The technicalities of ‘Hamari Adhuri Kahani’ are deft in the sense that it has been shot with a refined touch. The production design is grand and the costumes are realistic too for the characters they portray. The editing could have been spruced up a bit and the duration should have been trimmed which would have sped up the pace of the film. Also, the editing decision to reveal such an important twist right at the start is baffling. Acting: ‘Hamari Adhuri Kahani’ stands on the pillars of its three lead actors. Vidya Balan doesn’t have much to do in the film except for crying her lungs out but she still manages to show maturity even in such a silly character. But ‘Hamari Adhuri Kahani’ is another proof of Vidya Balan going wrong with her movie choices. We expect more from her now that Kangana Ranaut has slowly started becoming the new Vidya Balan in the industry. Emraan Hashmi plays a character that he hasn’t really played before – a subdued character who is supposed to speak through his gazes and stares. We are used to see him perform loudmouth, streetsmart, underdog characters. However, Emraan doesn’t disappoint and does whatever he can to salvage the film. Watch him act in the scene where he tears up. Rajkumar Rao, again is let down by a shoddily written, one dimensional character and he shouts and squirms through his role. We expect better. Namit Das and Madhurima Tuli are decent in their cameos. Conclusion: ‘Hamari Adhuri Kahani’ has a good fundamental story which holds promise but the overtly emotional treatment and the baffling bipolar decisions made by the characters, only ends up frustrating the viewer. At one point it promises to be progressive and then meanders into regressive territory once again. Shahid Kapoor to get married in Greece? Humari adhuri kahani should have better been called humari adhuri kahani!! Meaning?? :0? Emraam hashmi days r gone. 7th back 2 back flops for Emraan. All the reviews are very bad. I have not seen a single 2.5 ratings yet. Going to take a trip to the crazy monsters world of Jurassic World. Not going to spend my money to see Balan’s tears..
Haha I m still laughing…. What is happening to emraan hashmi…. thank u emmy for doing another crap and allowing ddd to now bcm a sure shot hit in india while its already a big success overseas. I’m sorry! But HAK reviews are similar to reviews of Mr. X, Roy or GIB etc. Feeling Terrible for emraan…Even though emraan performance is good…But what went wrong is Mohit suri’s direction(He was good in his previous movies),Editing,dialouges…I expect much from Vidya and Rajkumar.. Superb film.. I liked it…. It has taken a good opening at plexes better than ddd…. Audience r fool to watch meaningless craps , party songs and ghatiya movies like hskd,htp,yjhd,.. So, DDD now has the opportunity to score big in the 2nd Week. Best film of the year. dont believe the bad reviews, this film is very entertaining and a masterpiece. 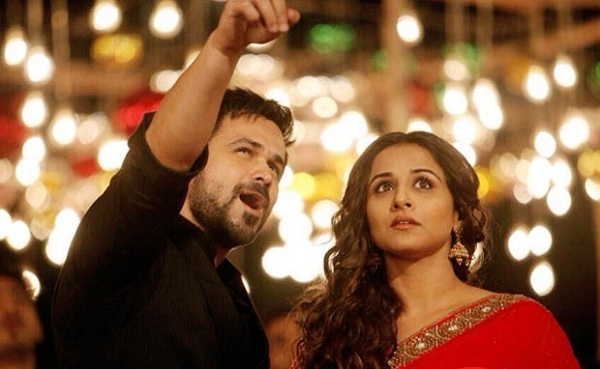 Emraan and Vidya will win every award this year. More entertaining that Tanu weds Manu returns and PK. Better than crap ddd , hskd,htp, tevar,roy,bv…. Its means another failure for Emran Hashmi, i truly feeling very sad for Emran Hashmi he is talented actor. Rajasthan has opened to 30 percent and noon occupancy 40 percent… Better than any film of this year except gabbar..